Beautiful Hand Blown Murano, 12.5" Tall Glass Vase having the "Spring Fever" Pattern. This is a Swirled (or Looped) Pattern, in Green, White and Yellow inside the Vase, that is shaped with a Trumpet Mouth or Top. A Brightly Colored and attractive Vase that Looks as lovely on the Mantle, as it does filled with Flowers... We have another very close match available. (see Item #O45). No Chips or Cracks, excellent condition. 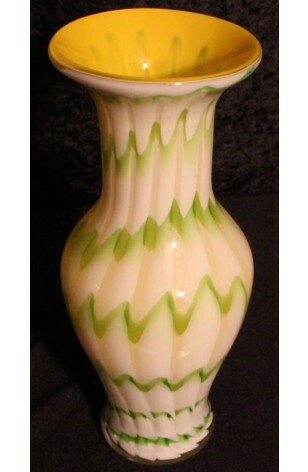 Beautiful Hand Blown Murano, 12.5" Tall Glass Vase having the "Spring Fever" Pattern. This is a Swirled (or Looped) Pattern, in Green, White and Yellow inside the Vase, that is shaped with a Trumpet Mouth or Top. A Brightly Colored and attractive Vase that Looks as lovely on the Mantle, as it does filled with Flowers... We have another very close match available, (see Item #O45). No Chips or Cracks, Very Good Resale Condition with no known defects.